A slave ship (? 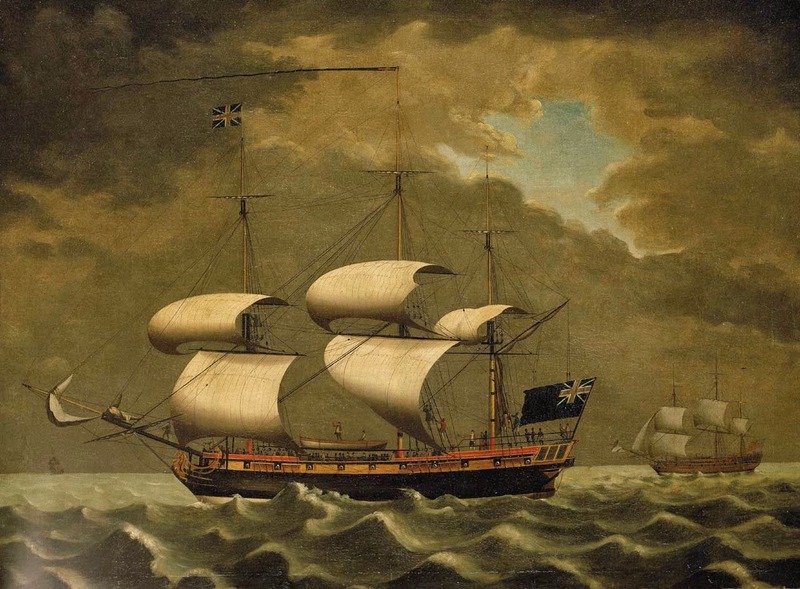 ), William Jackson, c. 1780, National Maritime Museum. 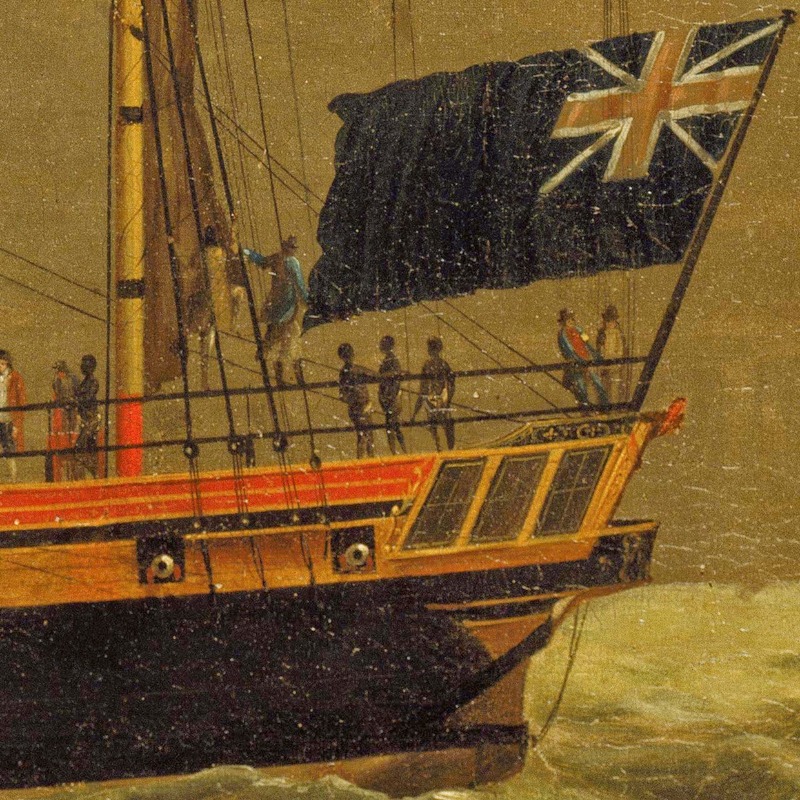 I usually avoid images of ships themselves, as the detail on sailors is slight, and they are painted so small they are often indistinguishable from passengers or officers. This image would have been the same were it not for a detail of the image expanded by the National Maritime Museum itself. 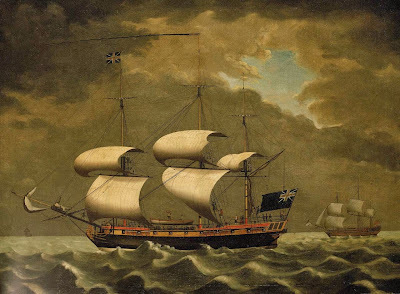 The precise circumstances of this painting are not clear, and it may have been commissioned for the Liverpool offices of a bank or merchant involved in slavery to present an acceptable view of the trade. We may be looking at early pro-slavery propaganda. This blog's focus has been as narrow as they come: the representations of common sailor's clothing in original eighteenth century images. Usually these images depict sailors drinking, cavorting with women, or acting as personifications of the British nation. These topics are connected to the slave trade, but not as directly as images like this one. It is not that I have been avoiding the slave trade, but rather that the type of images I have been examining (political cartoons for example) simply didn't address it. What is somewhat disturbing about this image, in our case, is that the sailors of the slave trade were virtually indistinguishable from those of other services. I've mentioned before the privateers, naval sailors, and merchantmen were largely interchangeable. This is equally true for slave trade sailors. In the center of the image and climbing the ratlines are a pair of sailors. In the foreground and slightly to the right just beside the blue ensign stands a tar in a longer blue jacket, ending about the mid thigh. His black round hat has a taller crown, and his slops end just below the knee. Really, there's nothing exceptional about this sailor. The tar behind him and to the left is similarly average. He wears a black knit cap, a brown jacket of equal length with a single vent in the back, and a pair of white breeches. There are other European figures in this image, some of whom could be sailors, but there's no way to be sure. This sobering painting is a reminder that it was average men who made up the slave trade, and engaged in one of the greatest and prolonged atrocities in human history. This painting, despite the caption given it by the artist, is I believe totally mislabeled. If the artist was like most, a typical "landsman" he probably did not know what he was looking at. Seeing Africans on deck in loin clothes gave him the wrong impression and he therefore labeled the ship as a slaver. So, what are the clues that led me to come to this conclusion? First of all, the flag, its the blue ensign of the Admiral of the Blue Fleet, legally at that time a strictly Royal Navy flag. If this were a merchant ship or slaver, it would be flying the red ensign which was for the merchant marine or civilian ships. Also, look at the "slaves", loitering about, one with his arm on the railing, all standing about scattered on the deck in a leisurely fashion, and no chains! Look at the officer at the stern mast staff, if you look carefully, you barely make out the white facings on his coat laced with gold, an RN captain. the fellow in red at the amid ship looks like a marine officer.. This is a very interesting piece of art and the presence of the Africans on deck has me intrigued so I'm going to look into this further. By the way, love your blog! I could make a lot more comments on some of the period art here, but am busy at the time, later then! "These are the command flags of the admirals in charge of the various divisions (or later of a particular grade within a given rank) were. The exception to this was the white, which carried a red cross (thus becoming the flag of St George) from around 1702. The order of seniority was changed in 1653 from red, blue and white to red, white and blue (which it still is). The white ensign also had a plain fly originally, but (for tactical reasons) a wide red cross (one-third of flag width) was added overall in 1702, and this was amended to its modern dimensions in 1707. The system of grading admirals by colour ceased in 1864, and all admirals thereafter flew a Cross of St George as a command flag. The general addition of red balls to indicate rank came in later - the use of boat flags in other words - because of the introduction of mastless ironclads." "In origin there were three naval squadrons, of the Red, White and Blue, and they took these colours from those of the Union Jack. The division was made in the 1680s, if I remember correctly. Because the Red Ensigns of England and Scotland had already been established as merchant flags a Red Ensign with the Union in the canton became the merchant flag of Great Britain upon Union in 1707. This led to potential confusion - was that ship a merchantman or a member of the red squadron? In 1864 it was decided to end this anomaly. Henceforth the White Ensign was reserved to the Royal Navy, the Blue Ensign undefaced to the Royal Naval Reserve and defaced with the appropriate departmental or territorial badge to government service, and the Red Ensign to the 'merchant navy' (as the term is in Britain). Now, as colonies became dominions they began to acquire navies. These all wore the White Ensign, but wore their appropriate territorial Blue ensign as a jack. The only geographical usage of the Red White and Blue that I know of, and which might be the source of this idea, was in the masthead pennant. Before 1864 this was St. George's Cross in them hoist and a fly of the Squadronal colour. After 1864 the home Royal Navy used the white pennant and colonial naval units used the blue. The red pennant was used briefly by the Royal Indian Marine between 1921 and 1928." ~Source: H. Gresham Carr Flags of the World, 1961, pp 121-8.